We’d love your help. Let us know what’s wrong with this preview of Blind Servitude by David Chattaway. Blind Servitude is the tale of a young boy's journey to find his courage in a world where fear is "We both looked deeply into each other's eyes and I knew that he felt the same fears and concerns I was feeling. Planning escape was very different to actually escaping and in that moment when our cell door sprung open, and freedom beckoned to us both, so did doubt and worry." To ask other readers questions about Blind Servitude, please sign up. I received a copy of this book from the author in exchange for review. Eli stumbles upon a possible way to flee his underground life, but is hope enough to guide him out of the darkness? Blind Servitude is a reasonably short story that has a definite feel of the old-time fable about it. Eli, the young boy at the centre of the story, is the unlikely hero, shifted from the complacency of his everyday life collecting and repairing tools for the workers by a desire for something more, something adventurous. He alone has the courage to believe that his mother and siblings may not yet be lost to death, after his discovery of a tunnel that shouldn’t exist, given what the mine-dwellers have always been told. The story unfolds fairly slowly, given the short length of the book, and this isn’t an action-packed adventure story by any means, despite the fact that there’s climbing and breaking and entering and pursuit by malevolent creatures all bound up in this small package. Instead the suspense builds slowly, all the time reflecting Eli’s personal growth as he faces challenges that cause him to question everything he has ever known and chases after a slim hope that there could be something better awaiting all the mine-dwellers provided they are prepared to risk letting go of their unhappy, but predictable lives. The characters aren’t particlarly developed as individuals, but each plays a significant role in Eli’s journey, particularly the guard whom Eli calls the Savage. The Savage is almost the personification of the mine-dwellers’ misery, subjugating the people through violence and threats in order to uphold a system that is unjust and ultimately unproductive for all but those at the top of the chain. Overall this is an ethereal tale that will have you reflecting on the power of hope and the playing-off between risk and reward. Blind Servitude is an incredible book about Eli, a young boy. He and his family are forced to work in the mines. They live in the mines because centuires ago, they were driven below ground. There are tales of fights and beasts that have been passed on through generations. Plus, most people are kept in line by a handful of guards. When the rest of his family believes that his mother is dead, Eli still has hopes that he can find her alive somewhere. Soon after that, his brother and sister are take Blind Servitude is an incredible book about Eli, a young boy. He and his family are forced to work in the mines. They live in the mines because centuires ago, they were driven below ground. There are tales of fights and beasts that have been passed on through generations. Plus, most people are kept in line by a handful of guards. When the rest of his family believes that his mother is dead, Eli still has hopes that he can find her alive somewhere. Soon after that, his brother and sister are taken and Eli has further hope that he can find them somewhere. Eli has the help of a friend, Peta, and he looks for a way to help everyone break free from the confines of the mine. I'm pretty stunned by this book. It's a really incredible book. The characters are amazing. Eli has an air of innocence and he's very selfless. Everything he does is to try and aid his family or friends. He worries when his father may kill a guard, or even at the thought that other guards might have to die in order for them to be free. The plot is wonderful. It's a little reminiscent of other media that I've seen or read before. However, the rest of the book is quite unique. It uses mysticism, hope and fear to steer the story along. The writing style of the author is quite charming and whimsical. They successfully manage to convey emotions and desires, with a few added portions of humour. My favourite part of the book is the illustrations, I have to admit. They're cute and really portray some of the characters well. The author dedicated this book to his Godson in the hope that when he is old enough to understand the message inside it will help guide him toward being a confident and courageous young man. I believe that it will. Blind Servitude is a 99 page novella which tells the story of Eli, an eleven year old boy, who lives underground with his family and works in very difficult conditions in a mine which produces “Goo” ( My take on this is OIL!). They have lived below ground so long that the memory of wha The author dedicated this book to his Godson in the hope that when he is old enough to understand the message inside it will help guide him toward being a confident and courageous young man. I believe that it will. Blind Servitude is a 99 page novella which tells the story of Eli, an eleven year old boy, who lives underground with his family and works in very difficult conditions in a mine which produces “Goo” ( My take on this is OIL!). They have lived below ground so long that the memory of what came before is long gone and they work in fear of abuse from the guards and the sound of the “siren” which marks the disappearance of one more person forever. When Eli starts to lose members of his own family he sets out to find them and learns along the way how to fight against despair and hopelessness. David Chattaway has chosen to let Eli, narrate much of the story and has done an excellent job giving him an appropriate voice. Drawings by Sarah Boese were interspersed throughout the PDF copy which I read and added greatly to the story for me. The residents of this underground world would gradually lose their eyesight, developing “milky white eyes” yet their slavery continued until they were incapable of working any further and disappeared (hence the title). How Eli changes this makes for an intriguing story sure to inspire. I would recommend this book for children of middle elementary school and up as well as for those who are young at heart. I was given a copy of this for review by the author, but the impressions are my honest reaction to reading Blind Servitude. Eli and a friend make some fascinating discoveries and suddenly Eli begins to question the set-up and develops a sudden sen “Blind Servitude” by David Chattaway is a both, grim and inspiring story about people living in slave like conditions in a mine under the surface of the earth. We are only as free as we want ourselves to be. So many self-help books have said this. We create our own prisons and our own limitations. Rarely do those books ever really get the point across to hit home. 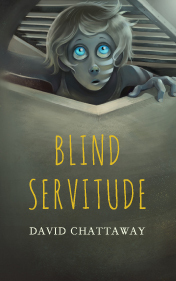 Blind Servitude, a novella by David Chattaway, does what they can't: it makes you believe. Humans have been driven from the surface of the Earth for generations, no one knowing exactly why. They are prisoners in the underground mines, where the only things one has to look forward to us either p We are only as free as we want ourselves to be. So many self-help books have said this. We create our own prisons and our own limitations. Humans have been driven from the surface of the Earth for generations, no one knowing exactly why. They are prisoners in the underground mines, where the only things one has to look forward to us either premature death or blindness. When Eli, a young boy, loses his family (except for his father), his mysterious friend Peta helps him find passageways to try and save his family and bring them to safety, but does he gave the courage to fight for light and freedom? Blind Servitude is a great story, with dystopian themes and a horror undertone, perhaps for readers thirteen and older. But adults, too, will love this book and find inspiration in its pages. The characters are all so wonderfully real, even the bad guys, that you feel as if you're in the mines with them. This is a breathless wonder of a book, one I hope gets revisited in the future. Disclosure: I am the author's brother. This is only David Chattaway's third published story. He is improving very quickly, and at this rate of writing, will have given Stephen King a run for his money in 20 years' time. This novella is written for youth and up. I found it to be very immersive, quickly building atmosphere in such a short story. David does a fantastic job painting a world where decisions are literally black and white, and where destiny and self esteem are directly related. An excitin Disclosure: I am the author's brother. An exciting tale of breaking out of your situation! David got me interested in the bigger picture, what the characters find at the end, and I would definitely read a follow-up! I'm looking forward to much more from this young fella, whom I can confirm is hilarious in real life despite not yet having shown us this in his body of work. Wow. This is the best book I have read in ages. David Chattaway delivers another incredible story. Blind Servitude revolves around a young boy named Eli and the dark and oppressive underground world that he has grown up in. It is a story of bravery, hope, and the inspiring actions of a young boy. This story is full of amazing characters with some surprising twists along the way. I absolutely loved this book, I could not put it down. It is an amazing read for all ages. I hope there are further books Wow. This is the best book I have read in ages. David Chattaway delivers another incredible story. Wonderful 'believe in yourself' YA paranormal novel! I loved the story and the characters. Good read! 'Singing Sand' received warm reviews - even making Adelaide-born David Chattaway has been writing since he was a teenager but only took his passion to the next level when he released his debut novella 'Singing Sand' in October 2013. Its sequel 'Quietus' quickly followed, released in February 2014 and not long after Chattaway re-released the books as one, complete volume - 'The Singing Sand Story'.